So - here's another new approach to pattern-making. I'm teaching an advanced pattern-making class at MCAD in a couple weeks and I've been trying all of these new ways of putting patterns together. It's been a blast trying to figure it out but it was definitely a challenge! 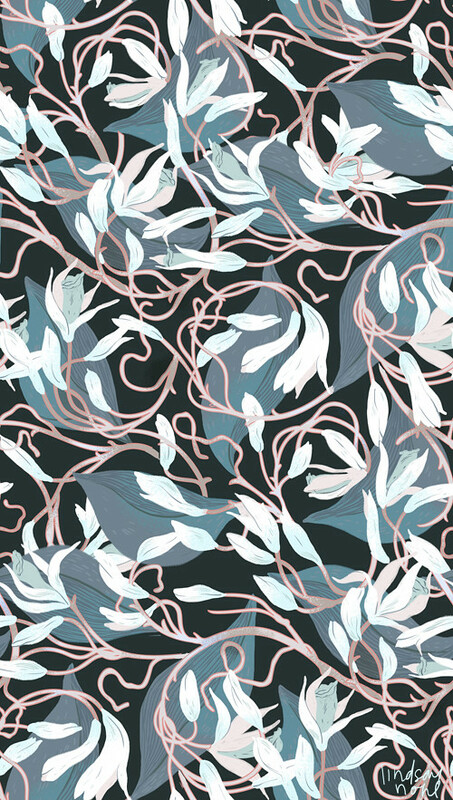 I tried a pattern with a couple layers this time - large foliage in the background, and smaller bits in the front. There are actually three layers that went into this and surprisingly, I started with some swirly vine things and went from there! I had a great time making it - sorry for the huge size, but I had to make a tall one to make it work! Hopefully it just makes the detail easier to see. What was interesting about this process was that I started out having to sketch the whole thing out before tossing it in the computer. This is certainly a new thing for me - as I usually just make a bunch of icons that are nice together and toss them. This time I had to puzzle piece the whole thing together before hand. It was actually really nice. I am really interested in doing some HUGE patterns. I'm sure you may have noticed that there posts are taller! The more I get into these, the bigger they're getting, and the more room I need to make these complex things look good! I think I'll try some kind of damask pattern in one of my next patterns. I'd really like to see if I can make a new method for those, too! This is cool Lindsay! I am so excited for the pattern class to start and can't wait to see what you come up with for us to work on!